Brother and sister arrived at Herschel's house in Bath in late August 1772. Bath's high season, which ran from fall to Easter, was just beginning. William and Alexander, who lodged with William, were busy with rehearsals, and William also with his many private students, young ladies and men. Caroline, who did not yet speak English, found she must manage without much help. At the breakfast table, William explained bookkeeping and other aspects of managing the household. Caroline was sent out alone to do the grocery shopping—although she discovered later that Alexander trailed behind her to make sure she returned home safely. Herschel's preoccupation with seeing the stars and planets for himself dovetailed with the talent he and his brother Alexander obviously both had for mechanical invention, and led to his experimentation with new forms of telescopes. At first he worked with lens-based or "refracting" telescopes. He soon became dissatisfied with the lenses, however. As white light passes through a lens and is brought to a focus, the different colors composing the light disperse at different angles, so that a colored "halo" surrounds the image. In the late eighteenth century, lensmakers had not yet discovered a way to reduce this unwanted effect, called chromatic aberration. times as much light as one with an opening 2 inches in diameter, because its geometric area is four times greater. The bigger the primary, Herschel knew, the fainter the objects one could see with the telescope. Whether or not Herschel already dreamed of making his own discoveries, he knew at least from the history of astronomy in Dr. Smith's Compleat System of Opticks that improvements in telescopes often led to new insights, even in the study of familiar solar system objects such as Saturn. In the early 1600s, shortly after the first telescopes were developed, Galileo had noticed mysterious ''ears'' on either side of Saturn, which he thought might be stationary moons of that planet. In 1659, the Dutch astronomer and mathematician Christiaan Huygens, with an improved telescope, clarified that the ''ears'' were rings; then in the 1670s, Cassini, with his improved optics, found the gap in Saturn's rings and discovered new moons circling the planet, too. It was worth building better telescopes even to look at known objects. Herschel's reward for this unceasing effort and experimentation took the form of a Newtonian design telescope (see figure 4.4). 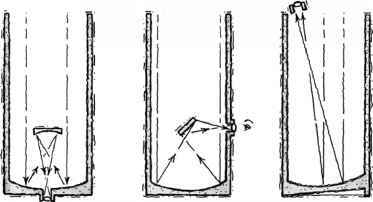 The Newtonian design differs from the Gregorian in requiring only one curved or figured mirror instead of two: a flat secondary mirror near the middle or top of the telescope tube shunts the light from the primary mirror to an eyepiece at the side of the telescope. The aperture diameter of his first satisfactory telescope was about 4 % inches, which today would be typical of an amateur's first telescope. On 1 March 1774, he inaugurated his first review of the heavens through this telescope, turning it first to the beautiful Orion nebula (see chapter 2, figure 2.7). His view of Saturn and its ring like ''two slender arms'' encircling the planet, he wrote in his memoir, gave him ''infinite satisfaction. ''20 The seriousness of his purpose is evident from the fact that he no longer used his diary to record his observations, but began a separate astronomical journal. As he sprinted to his telescope during borrowed intervals of time, Herschel's imagination was likely to dwell on the mountainous landscapes of the moon or the mottled, reddish surface of Mars. In the early years of his forays into astronomy, Herschel made mostly solar, lunar, and planetary observations, following the lead of his favorite textbook authors. He initiated a long-term series of observations of the planet Venus aimed at determining its diameter, its period of rotation, the nature of its surface, and whether or not the planet has an atmosphere. Bright white spots on Mars, that planet's icy polar caps, aroused his curiosity in 1777; repeated observations allowed him to observe their seasonal changes in size. Saturn, which he called ''one of the most engaging objects that astronomy offers to our view,'' he returned to again and again.22 Initially Herschel, like his contemporaries in astronomy, viewed solar system objects as the natural concern of the astronomer; he paid little attention to the more distant stars unless they called attention to themselves by varying in brightness or by moving with respect to the fixed pattern of stars. (Recall that Halley had found some examples of stars with ''proper motion,'' and that Wright had incorporated this finding in his models of the stellar system.) Later, Herschel himself was to open up the realm of the stars to exploration. Herschel's self-education in astronomy and telescope construction is all the more remarkable considering that during the late 1770s his musical career was still gaining momentum. In 1776, he took on the responsibilities of Director of the Public Concerts at Bath. Meanwhile, Caroline's duties at home became more complex as William and Alexander turned their rented house into a telescope factory. In fact, her domestic burden increased in the late 1770s when her younger brother Dietrich, a high-spirited but irresponsible young man, came to live with his siblings following an abortive attempt to sail for a life of adventure in India. She was not a little relieved when he returned to Hanover in 1779. But musical demands on Caroline's time did not slacken. She became an accomplished singer and even received an invitation to perform at a festival in the city of Birmingham — although she declined it because she had decided not to sing in public unless her brother conducted.